The new BMW 5 Series Diesel Saloon has always been one of the best exec cars money can buy – and now it’s even better. Superbly equipped, fairly affordable to run and great to drive, it’s got a tremendous appeal to anyone who wants a classy, assured and confident driving experience. As usual, it’s got bags of luxury too, and while some enthusiasts will bemoan the lack of a manual gearbox, its pair of automatics are excellent. OSV takes a closer look at what it’s all about with our 2018 BMW 5 Series Diesel Saloon review. This is easily one of the best cars you’ll ever drive. Whereas a car can either be entertaining in country roads or supremely comfortable as it eats up motorway miles but rarely both, the 5 Series Saloon is both. BMW may have ditched their “ultimate driving machine” tag but its spirit lives on here. Insulation is excellent and adds to a fine experience for both the driver and their passengers. The suspension system, meanwhile, does a grand job of smoothing out lumps and bumps in the road and ride quality is fantastic. In terms of how it drives, the steering is communicative and offers lots of feedback, and there is minimal body lean in bends. All models are pretty agile as it is, but adding four-wheel-steering takes things up a notch, as does the adjustable suspension. Buyers can also specify the brands xDrive four-wheel-drive system which adds more traction and grip. It also minimises oversteer, although some drivers won’t want this. Neither will some drivers appreciate the absence of a manual gearbox. The two automatics on offer are well worth a try; not only do they improve the economy but they suit the car perfectly. Buyers can choose between a smooth 8-speed automatic transmission and a sportier version. The diesel engine range kicks off with a 520d model that’s powered by a 2.0-litre engine. It develops 187bhp and can get you from a standstill to 62mph in 7.5 seconds, which makes it around a half a second faster than last time. The 2.0-litre diesel engine also powers the 525d model, which develops 228bhp and has a 0-62 time of 6.6 seconds. The 530d xDrive is powered by a 3.0-litre diesel engine and gets four-wheel-drive as standard. Its engine develops 261bhp, has a 0-62 time of 5.4 seconds and feels as fast, strong and powerful as those numbers suggest. The 5 Series Saloon was never going to let us down with a weak cabin and it hasn’t. Inside, it’s a thing of beauty that glistens with quality and luxury. It’s not massively different from its predecessor in terms of design but we aren’t complaining as it means you once again get a logically arranged, well-built dashboard and almost perfect ergonomics. 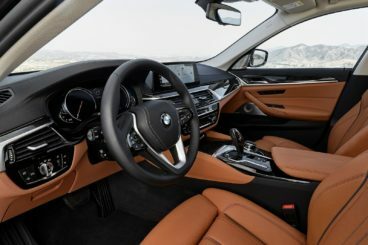 The materials are premium, the latest connectivity systems are present and correct, as is the brands impressive iDrive infotainment system that you control via a rotary controller. The screen sits on top of the dash, as infotainment systems are apt to do in modern cars. Its 10.25” screen integrates well with the whole design and the aesthetics of the cabin are spot on. Ride comfort is excellent too, although if you want to be as comfortable as possible you’d need to stick to the smaller alloys. Over bigger bumps, the larger wheels will crash. 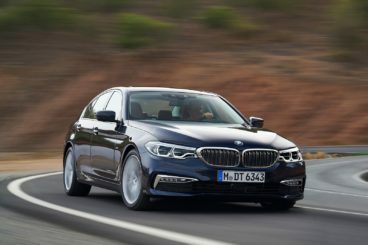 Is the BMW 5 Series Diesel Saloon practical? It isn’t short on space, with those upfront and in the rear well accommodated for. Head, elbow and legroom are excellent but anyone sat in the middle rear seat will have to contend with a pronounced floor hump. Storage spaces include a good-sized central cubbyhole and glovebox, as well as door bins and various cup holders. The boot, meanwhile, measures 530-litres. It’s a user-friendly boot that has a low lip and a wide opening, but the wheel arches do intrude. Folding rear seats are a £330 extra. Standard kit is decent across the range, with the entry SE model getting the likes of iDrive Touch, a digital radio, cruise control, leather seats, 18” alloys, a multifunction instrument panel, heated front seats, LED headlights, ambient lighting, as well as ConnectDrive, a connectivity system that gives you access to BMW’s concierge service. In terms of safety, the 5 Series Saloon scored all five stars when it was crash-tested by Euro NCAP. Its standard safety kit includes a tyre pressure monitoring system, electronic stability control and 6 airbags. A Driving Assistant Plus package is part of the optional extras and it’s well worth checking out. It comes with all kinds of features that will make your car more secure, such as an evasion aid, a lane change assistant, a keeping assistant, steering and lane control assistant and wrong way warning. Prices for the new car start out from £36,710 and rise to £52,195. For more information on our leasing deals, check out our page here. In terms of its running costs, the economy is better right across the board. The diesel engines all benefit from AdBlue emissions-reducing tech, and the 520d model is able to return 68.8mpg while emitting 108g/km of CO2. For a car of this size, that’s very impressive. It also has a BiK rating of just 23%. The 520d EfficientDynamics model is even more frugal and can return 72.4mpg while emitting just 102g/km. If, however, you want more performance you’ll want to take a look at the 525d model that returns 64.2mpg and emits 121g/km. The 530d model, meanwhile, is good for 60.1mpg, which is excellent when you consider how much power it has. For some, there are few finer things in life than a BMW Saloon. It shares its platform with the 7 Series limo but its lightweight aluminium structure ensures tidy handling prowess. Even the powerful 530d model returns over the 60mpg economy. They can easily make the car more expensive than it needs to be. Bland is probably the wrong word, but some buyers will find it too business-like and conservative. Let’s see how the car fares against its rivals in the comparison section of our 2018 BMW 5 Series Diesel Saloon review. The new Audi A6 Diesel Saloon is one of the best large exec saloons available. Its excellent interior impresses, as do its engines that are both powerful and efficient. Unlike the BMW, the Audi doesn’t manage to be both a comfortable cruiser and a bag of fun down country lanes. Instead, it’s very much a capable cruiser – if a fast one at that. Its steering is light, its suspension setup does a good job at smoothing out poorer road surfaces, and most models can be specified with Quattro four-wheel-drive. However, adding Quattro won’t improve the car’s drivability. Opting for the sports suspension and larger alloys will give the A6 a bit more feel in bends, but if you’re that bothered about an engaging driving experience, you may as well just go for the 5 Series. In terms of the engines, the Audi A6 is only offered with diesels. They’re all quick, with even the entry-level 2.0-litre diesel able to complete the 0-62 dash in 8.1 seconds. It’s an Ultra engine that will save you cash at the pumps, but a bigger 3.0-litre 238bhp diesel engine will suit most buyers. It sees off 0-62 in less than 7.0 seconds but if you need even more pace, the range-topping 316bhp bi-turbo model has a 0-62 time of 5.0 seconds. 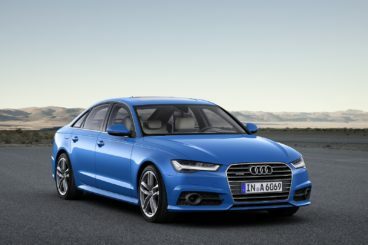 Unlike the BMW, Audi offers a 6-speed manual gearbox – but it’s only available with the entry-level engine. Running costs? The 2.0-litre Ultra diesel returns 67.3mpg, but you’ll need to upgrade from the manual ‘box to the 7-speed automatic and stick to the smaller alloys to get those figures. The 3.0-litre diesel is a more impressive engine, and it returns 55.4mpg if you stick to the 238bhp and 47.1mpg if you’re tempted by the bi-turbo model. Inside, it’s easy for the driver to get comfortable thanks to an adjustable driver’s seat and steering wheel, and overall the cabin is easy to get used to. It’s not without criticisms though; for example, the fact that the MMI scroll wheel turns the opposite way to what you’d expect is just plain annoying. Insulation from the diesel engines is good, and we have no complaints about the quality of materials used or the build quality. Soft-touch plastics abound and the controls are neatly arranged. Is the Audi A6 Diesel Saloon practical? Its 530-litre boot is on par with the BMW, while folding the rear seats increases its capacity to 995-litres. There’s plenty of space upfront or in the rear for taller adults, and large windows ensure it feels pretty airy. 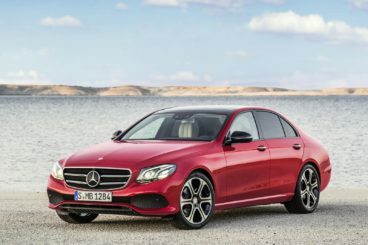 The new Mercedes E Class Diesel Saloon is packed with cutting-edge technology and can boast excellent refinement. One thing that’s noticeable about the way the Mercedes drives is that it’s not as sharp as the 5 Series. That was never Mercedes’ intention, however, but some buyers won’t like how lifeless and inert the steering feels at times. Even if you switch its driving mode to Sport+, things don’t really improve. That said, the E Class offers an almost unmatched relaxed driving experience. The E350d version gets AIRMATIC air suspension as standard for supreme comfort, but all models – despite being extra heavy – feel comfortable and work well as effortless cruisers. In terms of the engines, both the E200d and E220d models are powered by a 2.0-litre diesel engine that develops 148bhp and 191bhp respectively. The E200d model covers the 0-62 sprint in 8.4 seconds, while the bigger E220d model does it in 7.3 seconds. Add four-wheel-drive and it covers it in 7.5 seconds. If you want more power and can afford it, the 3.0-litre V6-powered E350d model sits at the top of the range. It can do 0-62 in 5.9 seconds and has a ridiculous amount of pulling power that makes overtaking a cinch. Like the BMW, all models are automatic-only. Running costs? Both the E200d and E220d models return an excellent 72.4mpg economy and emit just 102g/km of CO2. The E350d, meanwhile, is good for 48.7mpg and it emits 153g/km of CO2. Inside, the E Class boasts a comfortable, roomy and classy interior that’s packed with lots of tech. That said, a lot of its high-tech is on the list of optional extras, such as Digital Vehicle Key, a 360-degree camera, Remote Parking Pilot and a 12.3” screen that dispenses with the usual dashboard instruments. Apart from that, buyers will appreciate the leather upholstery, the fantastic ergonomics and the soft-touch plastics that make it feel super luxurious. Is the Mercedes E Class Diesel Saloon practical? Its wheelbase is longer than last time and this means passengers are better catered for than ever. Combine this with excellent ride quality and you can see how the E Class offers a pleasant experience. There’s lots of storage spaces on offer, including a huge glove box, and the boot measures 540-litres, which just shades the BMW. The 5 Series is now over 40 years old and has reached the peak of middle-aged maturity: It’s sophistication, confident in its own skin and can knock the spots of young pretenders. Refined, elegant but also powerful and pretty damn fast, the new BMW 5 Series Diesel Saloon is an excellent car. ARE YOU INTERESTED IN GETTING A Saloon?